The Sun Storage J4200 and J4400 Arrays are general purpose, high-availability, and cost-effective serial attached SCSI (SAS) devices. The J4200 is a 2U, 12-disk tray and the J4400 is a 4U, 24-disk tray. Each supports SAS and Serial Advanced Technology Architecture (SATA) disk drives. The main components in each array are hot-swappable, including the SAS Interface Module (SIM) boards and drives, and the dual load-sharing power supplies and fans, providing a fault-tolerant environment with no single point of failure. See the SUN J4200 / J4400 System Overview and J4200 / J4400 Release Notes documents for more detailed information. iStorage Networks stocks SUN J4200 and J4400 Field Replaceable Unit disk drives. 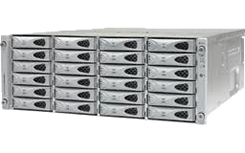 J4200 / J4400 Chassis, Controllers, Power Supplies, and other Customer Replaceable Units are available. - The J4200/J4400 arrays supports up to 600GB 15K SAS drives and 2TB 7.2K SATA II drives. - You can interconnect up to four J4200/J4400 trays, with up to 48 drives in interconnected J4200s and up to 96 drives in interconnected J4400s. See the Disk section of the Sun Storage J4400 Array Components List in the Oracle System Handbook for more information. Contact us if you need quantity discount pricing, availability, or integration assistance for your SUN Storage J4200 or J4400 Array.